Here’s a good example of how to construct a memorable tune by the underrated pianist Freddie Redd. Notice in only 16 bars he fits in a statement of a simple theme, a repetition of the theme molded to fit the bluesy chord structure, a counter-melody that contrasts both the rhythm and tonality of the first two phrases, and a return to the theme with both horns playing unison to emphasize the high point of the melody (E-natural in bar 14). Of course, it doesn’t hurt to have great players like Jackie McLean, Tina Brooks, Paul Chambers and Louis Hayes on your recording too. 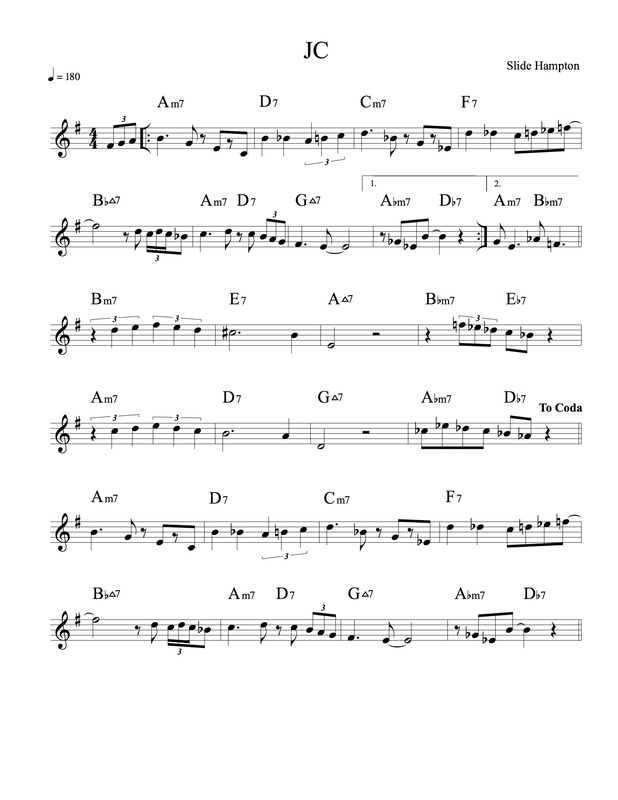 This entry was posted in Uncategorized and tagged Freddie Redd, jazz, lead sheet, Melanie, music, Noteheads, transcription on November 28, 2015 by noteheads. Here’s a fun and energetic vamp from one of my favorite organ players, Charles Earland. The tune closes out his Third Degree Burn album. 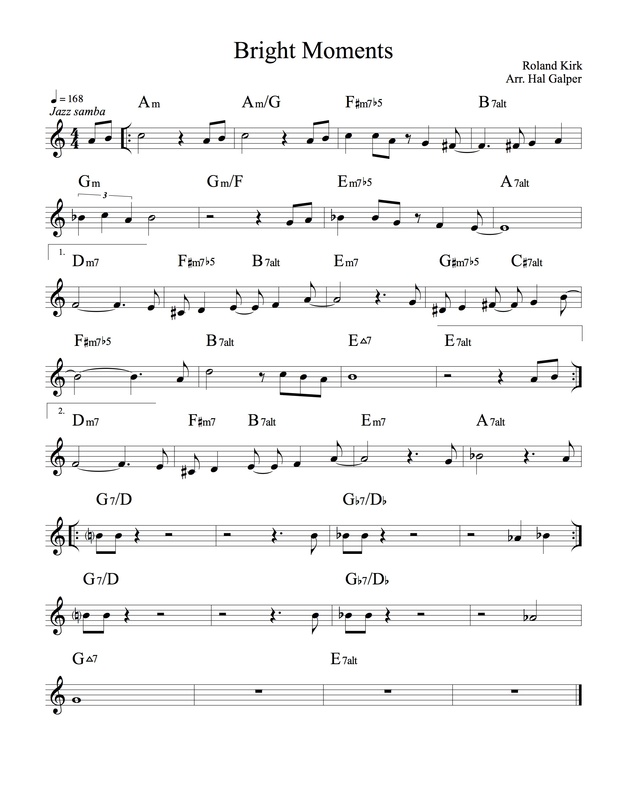 This entry was posted in Uncategorized and tagged Charles Earland, Cosmic Phriends, jazz, lead sheet, music, Noteheads, transcription on November 21, 2015 by noteheads. This simple but effective arrangement of Roland Kirk’s “Bright Moments” comes from pianist Hal Galper’s trio album Invitation To A Concert. This entry was posted in Uncategorized and tagged Bright Moments, Hal Galper, jazz, lead sheet, music, Noteheads, Roland Kirk, transcription on November 13, 2015 by noteheads. While recording his 1980 album Good Cookin’, Junior Cook asked trombonist Slide Hampton to write a tune based on John Coltrane’s “Lazy Bird”, itself a rewrite of Tadd Dameron’s “Lady Bird”. The chords for the head and shout chorus differ slightly from the original, but the band solos on Trane’s Lazy Bird changes. This entry was posted in Uncategorized and tagged jazz, JC, Junior Cook, lead sheet, music, Noteheads, Slide Hampton, transcription on November 6, 2015 by noteheads.